You already know that you can get your e-mail by logging into a website on the Internet. What if you could also get word processing, spreadsheet or presentation software as well? Instead of installing Quickbooks and maintaining the database on a server located at your office, why not login to ClarityAccounting or Quickbooks Online and have access to your data from anywhere, anytime, within minutes? The ability to run a business with your entire server structure online is the embodiment of cloud computing. No more servers to install, manage, update or upgrade. Leave behind the expensive software for which you purchase a license for each of your computers and instead pay for only what you need. One employee could work using the same software from any computer they choose without having to purchase and install the software on any of the computers. This saves potentially thousands of dollars in software licensing alone. Server functions will become a thing of the past. File servers and backup systems are being replaced by companies like SugarSync, OpenDrive and Mozy. These services allow you to save to their server online as if it were a server in your office. If you need strictly backup services for your company, you could employ services from companies like CloudReplica. If your onsite server goes toes up, the operation will failover to the CloudReplica service. Once you have your server back up and running, you can replicate the entire system from CloudReplica to your new box. 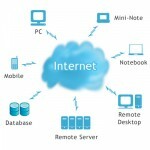 Cloud computing is the future of IT. The technological advances in networking have closed the gap in long distance communications and makes real-time, offsite processing a reality. Thanks for the blog! Great content. Just met web2.0. Thanks for this ketchup. Sounds too good to be true! Yet, this massive technology transition is on its way. There is one major gotcha to this, and I don’t how this will work out. The most important layer of this type of service will become the pipe to the internet. We are fortunate to have fiber here, but many small businesses are still laboring in the T1 world. Without fiber, the speed will be too slow to support a lot of folks working in the cloud. And, what happens if you lose the pipe? Sure, one can go somewhere else and connect with any internet connection, or switch to wireless access. Speed will slow down, but at least the work process can continue. But what do the 200 or 300 or 400 people in the larger companies do? I am not talking about Fortune 1000 companies, but rather the work of the SMB’s. Can you imagine the turmoil in trying to get all those folks somewhere that they can work? And if the solution is WIFI, what an expense that would be. Anyone got any answers on this? It’s worth adding Standing Cloud (http://www.standingcloud.com) to this mix. The service makes it easy to deploy and manage applications from a lengthy list of open source options. With these applications you only have to pay for the hosting, and not per-user for the software. The service also gives you and your technical folks more flexibility (for example, for integration or customization) if you need it. Mark, If a SMB is still using T1s then they need to call their cable company and move to a fiber connection from them! The cost is far less and the bandwidth is far greater. Most of the cable companies nationwide understand that not only will they be enhancing the businesses in the area they will be tapping into the retail residential market at the same time. Thanks for this explanation of just what is cloud computing. Marketing makes it seem that the cloud is a cheap solution to a corporate problem. You’ll need to evaluate the costs before going in though. You’ll still need systems administrators to maintain your server instances in the cloud infrastructure. Perhaps even more administrators then you have now with the presumption being that you’ll end up spinning up more virtual machines then you have servers in your current environment. Like any other service, there is a cost associated with cloud services as well. So, while you’re off putting some of your current server costs and datacenter costs, you gain cpu per hour costs. Another issue with cloud computing is that there are a lot of variables to troubleshoot through. If company X puts a low latency application onto the cloud and the application isn’t working correctly, where does company X begin troubleshooting? At the OS that they are using? On the virtual machine that the OS they are using is on? Perhaps the OS that the virtual machine is running on, or even the hardware that the base OS is on. Possibly its the physical proximity of my application servers to my database servers or disk. These are things I have little control over in a cloud environment. More layers of complexity lead to greater layers of troubleshooting. The last issue that I can think of with cloud computing, is trying to get someone on the phone at the cloud provider. Even if you’re able to get someone on the line, you’re just one of hundreds or even thousands of customers. What will be the level of support or responsiveness that they give you? What kind of leverage do you have with them? I’m not saying that cloud computing is a bad thing. Certainly for some applications it’s great, but for others it’s not. The decision to put an application on a cloud must be well thought out. This is perhaps the most considered discussion thread I’ve yet seen surrounding Cloud Computing. The point that it works but that there are aspects to it that should be evaluated against each company’s individual situation comes through loud and clear. Maybe even more important is an underlying message pointing out that it is important that each company have technically competent expertise involved in vetting the fit and decision process surrounding any discussion of moving to the cloud. It isn’t one size fits all nor is it all hype. It’s just another tool in the evolving toolkit available for crafting solutions to helping companies be more efficient.